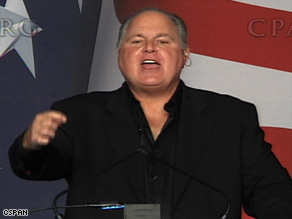 Conservative talk show host Rush Limbaugh energizes crowd of supporters in CPAC keynote speech. WASHINGTON (CNN) - White House chief of staff Rahm Emanuel said Sunday that Rush Limbaugh is the face of the GOP. "He is the voice and the intellectual force and energy behind the Republican party, and he has been up front about what he views, and hasn't stepped back from that, which is he hopes for failure," Emanuel said on CBS's Face the Nation. "He said it, and I compliment him on his honesty," Emanuel said. "But that's their philosophy that's enunciated by Rush Limbaugh and I think that's the wrong philosophy for America." Limbaugh was the headline speaker at this week's Conservative Political Action Conference in Washington. "What is so strange about being honest and saying I want Barack Obama to fail if his mission is to restructure and reform this country so that capitalism and individual liberty are not its foundation?," he asked the raucous CPAC crowd during his 90 minute address on Saturday. Speaking on ABC's This Week, House Republican Whip Eric Cantor said he disagreed with Limbaugh's comments. "And I don't - I don't think anyone wants anything to fail right now. We have such challenges. What we need to do is we need to put forth solutions to the problems that real families are facing today."